This program received the Multimedia International Award: For Excellence in the use of media for religious communication as Best Entry in the category of print in Rome, 1995. 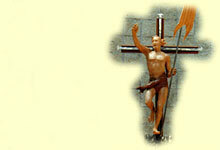 This program lays the foundation for a lifelong faith within the Catholic community. The goodness of God, Jesus as our friend, Christian symbols, and the importance of love are woven throughout it. The illustrations and photos are strikingly beautiful. 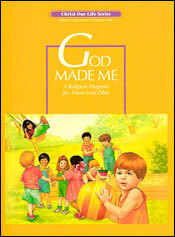 God Made Me helps the children explore the wonder of themselves and all that God enabled them to do. God Made the World leads the children to discover the people and things living and nonliving that the good God filled the world with for them. The lessons are adaptable for one-, three-, or five-day preschool programs. Each year’s program offers 25 regular lessons and 10 supplementary lessons for special days. The program has two components a child’s book of tearout cards and a catechist’s manual.